Growing up to 1.5m (5ft), although it can easily be kept shorter by pruning, Rovada will reward you with about 10kgs of fruit per bush each season. Happy in sun, a slightly shaded spot or even planted next to a tricky north facing wall, this great variety is resistant to diseases that affect other redcurrants. The jewel-like, sharp flavoured fruits of this redcurrant are loved by leading chefs and are perfect for adding to pork dishes, tarts, summer puddings, cheesecakes or turning into long-lasting jellies. Packed full of vitamins, they almost sparkling in the sun and drip pendulously from plants in long strings, making them perfect for adding an ornamental touch to beds or patios when grown in containers. Growing up to 1.5m (5ft), although it can easily be kept shorter by pruning, Rovada will reward you with about 10kgs of fruit per bush each season. 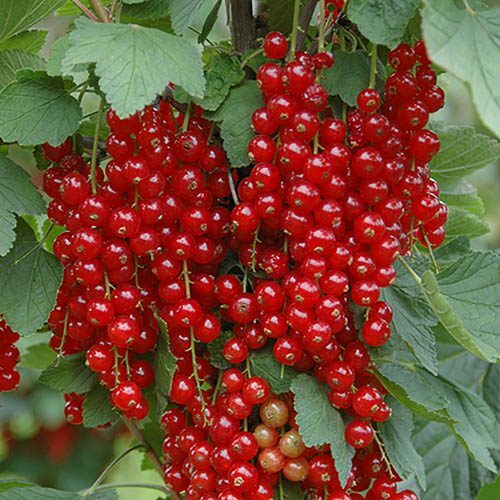 Happy in sun, a slightly shaded spot or even planted next to a tricky north facing wall, this great variety is resistant to diseases that affect other redcurrants.